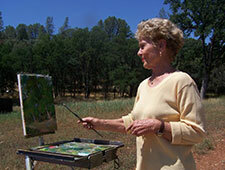 Judie Cain works her magic with practiced skill primarily in oil paints. Several of her works are in print, Giclee and on home products. Working from live models, on location, and/or from photo references from her travels, she strives to capture the light, liveliness, and the mood of the moment through quick strokes of vibrant colors, using brush and/or painting knife. At home with a variety of subjects, she finds excitement in even the most ordinary things such as the nostalgia of a Victorian porch, a bouquet of her treasured roses and scenes from her gardens, expansive landscapes, animals, or children on the beach. A native of Burlingame, CA, Judie Cain studied at California College of Arts & Crafts, in Oakland, CA after high school. “I felt very intimidated by the talent there at the time.” (Her early art attempts went from doodles on scratch pads and work in modeling clay to decorating for school dances and events.) She has taken inspiration from many great artists, particularly John Singer Sargent’s memorable portraits, Joaquin Sorolla’s magnificent renderings of people and animals at ocean-side, as well as Monet’s ability to capture atmosphere.